Armed with volunteers and 15 months until a deadline, former Attorney General Terry Goddard launched a new bid Tuesday to end "dark money'' anonymous donations to Arizona political campaigns. Arizonans may get a chance to decide whether they want to find out who is trying to influence their elections. 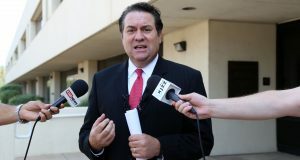 Attorney General Mark Brnovich issued a legal opinion December 7 saying that, with only narrow exceptions, the Legislature has “unrestricted’’ authority to redefine the powers and duties of the Arizona Board of Regents.